How much do farm workers earn? USDA's survey of farm employers reported that California's field and livestock workers earned almost $12 an hour in 2015, equivalent to $25,000 for full-time equivalent (FTE) work (2,080 hours). 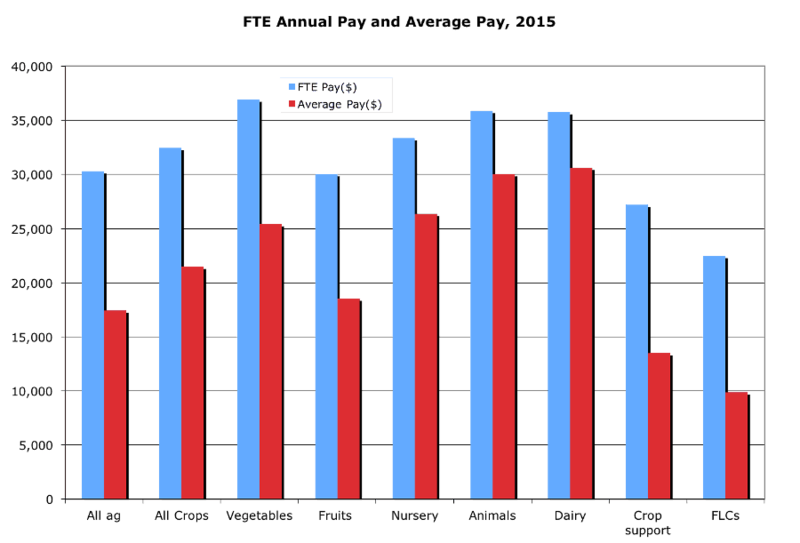 Average annual FTE pay for all workers employed in agriculture, forestry and fisheries (NAICS 11) in 2015 was $30,300, but actual worker pay averaged only $17,400 due to seasonality and turnover. In animal agriculture, actual pay was 84 percent of FTE pay, while for FLC employees, actual pay was 44 percent of FTE pay.